Question of the day: why won’t George Osborne say where he will find another £10 billion of cuts in welfare? The obvious answer is that he doesn’t want us to find out before the election but there is a more immediate one too: because he can get away with it. I found myself shouting at the radio twice today as interviewers failed to pin down first Osborne and then financial secretary David Gauke. The £10 billion figure is the so-far unexplained bit of the total £12 billion of welfare cuts Osborne is planning after the election. It matters both in its own right and because it enables him to deflect the Office for Budget Responsibility’s point about ‘rollercoaster’ cuts in public services. On the Today programme, Jim Naughtie put the question like this: ‘Do you have a plan that you aren’t telling us or don’t you have a plan?’ It encapsulated the point very well but Osborne promptly wriggled off the hook with a load of waffle about pensioners and what’s happened in this parliament. The only specific thing he mentioned was that he was preparing to freeze working age benefits except disability benefits. However, this two-year measure accounts for the £2 billion cuts he has already announced. So step forward David Gauke. ‘Don’t voters have a right to know before the general election?’ asked Martha Kearney on The World at One. She pressed him further. If he wouldn’t say what he would cut, would he say what he would rule out? Would he rule out cuts in child benefit? ‘I’m not going to get into ruling out measures,’ said Gauke. Much waffle followed. Like his boss, he was playing for time, knowing lack of it would enable him to wriggle out of answering the question. But can the Conservatives really get away with this for another 48 days? This is not like 2010 when everyone knew that they would implement deep cuts after the election but they could argue that they needed to see how bad the public finances were first. This time around they have been in office for five years and the ‘plan’ for £12 billion of cuts in welfare has been in place for two years. So what is it? 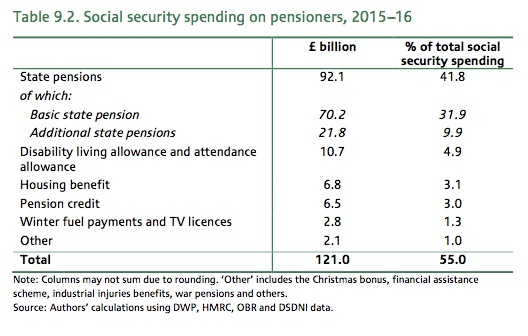 The key point is that the £12 billion savings will have to come from less than half the total social security budget. Most of the big savings so far have come not from cuts in individual benefits but from changes in annual uprating, first to CPI inflation rather than RPI, then to 1 per cent a year. Osborne’s plan to save £2 billion is to extend that to a complete freeze of working age benefits except disability benefits for two years after the election. According to the IFS analysis, the only cut that would clear Osborne’s £12 billion in one go (with an extra £1 billion on top) would be to freeze all benefits except the state pension for the full five years of the next parliament. This would cost 16 million families around £800 a year each. Note though that this would hit a range of other benefits that go to pensioners and would break the pledge made by David Cameron to protect them. Restricting the five-year freeze to working age benefits alone would save £9.4 billion. 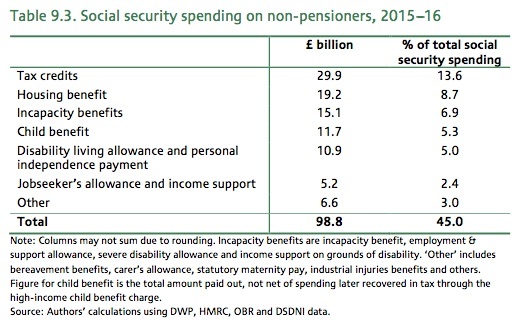 Restricting it to working age non-disability benefits would save £6.9 billion. These figures are obviously highly dependent on the rate of inflation. The Conservatives have floated some other cuts in specific benefits but the savings from them will be miniscule. Removing housing benefit from all under-21s would in theory save £700 million. In practice, it’s hard to see it being implemented without exemptions for people who are working and for families with children. That would reduce the saving to just £300 million. Removing housing benefit from the under-25s (an idea once floated by Cameron) would only save £600 million with the same exemptions in place. Another Tory scheme (this time from Iain Duncan Smith) is to limit child benefit to the first two children in a family. This would save at most £1.1 billion (with 1.2 million families losing £1,000 a year each) but only £300 million if it only applied to non-working families. Setting the limit at three children would save £300 million at most, or just £100 million on non-working families. Finally, there’s the benefit cap, which the Conservatives want to reduce from £26,000 to £23,000. This would save just £135 million but it would mean a £3,000 loss of income for the 27,000 families already affected plus another 70,000 who would be newly capped. It’s hard to see how that could be done without substantial extra discretionary help in place. And, as Alex Marsh just reminded me on Twitter, the existing cap only just survived this week’s human rights challenge in the Supreme Court. Mike Spencer explains more here about the judgement that saw two judges dissent from the majority view and a third wavering before siding with the majority that the cap is lawful. Would a harsher cap, or any other cut that affects the rights of children, fare as well? Means testing universal credit more aggressively – up to £2 billion a year could be saved the amount that goes to people in work, but this completely undermine the logic of ‘making work pay’. Incorporating child benefit in universal credit – effectively means testing it. This could save £4.8 billion a year but would mean 4.3 million families losing over £1,000 a year each. More cuts in tax credits – reversing real terms increases in child tax credits since 2003/04 would save £5.1 billion a year. But it would mean 3.7 million families losing £1,400 a year and increase child poverty by 300,000 children. Means testing disability benefits – taxing DLA and PIP would save £915 million a year. Restricting housing benefit – only paying 90 per cent of the rent would save £1.6 billion a year in the social sector and another £900 million in the private rented sector. Allowing social rents to rise to local housing allowance levels, while not increasing housing benefit entitlement, would save much more but the IFS notes dryly that ‘more broadly, reforms in this area need to be considered in the light of the overall purpose of maintaining a social sector distinct from the private housing market’. It might have added that it would also destroy the current basis for financing new affordable homes. (It’s worth noting though that in January 2014 Osborne himself identified restricting council housing for people earning more than £60,000 as a welfare cut). With options like these, you can see just how deep the cuts would have to go to meet Osborne’s £12 billion target. It’s clear that the cuts would hit the Tories’ cherished ‘hardworking families’ as well as those out of work. They would cost millions of vulnerable people hundreds or even thousands of pounds a year each. It’s hard to see how he can avoid hitting disabled people and even pensioners. All of which explains why Osborne is so reluctant to spell out where the axe will fall. And why journalists need to keep asking him the question, Paxman-style if necessary, until he answers it. I have a feeling that they’re mostly going to focus on the possible savings if IDS can get Universal Credit to work. I know some working families with children who said that they wouldn’t apply for it with such conditionality. Also, with such conditionality, you lose the whole of your housing and any other income if sanctioned, and we know just how many sanctions are already handed out to those on JSA; I imagine the numbers will rise drastically when families start claiming. You’ll lose PIP if you’re turned down for ESA on reassessment, but worse, it now seems that you’ll not only have no income during the Mandatory Reconsideration, but won’t even be paid the assessment rate when your appeal is lodged. Presumably then, you’ll also lose the housing element. I don’t know how these numbers add up; what the savings will be on the whole, but likely there will be a combination of those you state. I agree – think the original plan for universal credit was to make it more generous to make work pay, then reap the long-term savings from more people working. But the generosity has already been undermined by cuts in the work allowance and maybe the real savings will come from increased conditionality, especially for people in work? That’s if universal credit happens of course… if not, the conditionality is still increased. Where are the additional cuts coming from – the welfare spend or the welfare benefit spend? If its the latter it cannot include tax credits. So there is a not so subtle semantic issue here. IDS gave a written answer in Parliament a few months back to say 2015/16 spending on welfare benefits (ie excluding tax credits) was £116 billion to the pensioner and £54 billion to those of working-age. Secondly, the figures in the tables above are open to question in both their total figures and in for example HB spend at £26 billion (£19.2 + £6.8) when the current total is just under £24 billion. Thirdly, given UC means every claimant of any benefit or tax credit gets every penny they are entitled to so there is no non take up of benefit or tax credits which mean, and can only men, that all the currently non claimed benefit and tax credits get paid thus increasing the overall cost. The idea that UC reduces the ‘welfare spend’ is a non starter as it can only increase the overall cost. Thanks Joe. The IFS thinks it means welfare spending including tax credits. Their figures are forecasts for 2015/16 so will be higher than current ones – though even then £2 billion difference on housing benefit is a lot. I thought that one of the points of UC was that it had more generous taper rates etc to make sure that ‘work always pays’ – so cutting them would defeat the object. On take-up, yes can see your point and could be even higher as current UC taper rate means much higher earners than now would be entitled to help with housing costs. But would someone not in the system claiming anything now be any more likely to get UC? Jules, the last question is the key one and has to be yes. Currently, by and large, any claim for 1 benefit is a claim for 1 benefit, yet in UC any claim for 1 benefit is a claim for all benefits and for tax credits as UC is a one-stop assessment for all. That is also evidenced in a roundabout way by the huge increase of in-work HB claimants up from 650k to 1.1m since May 2010 which is all to do with the “work will always pay more” political soundbite and employers offering jobs based on this. Just as those unemployed have been inundated with better off in work calculations the same goes for employers who use this to offer low paid employment to capture those unemployed escaping dole, sanctions or benefit cap. That will continue and so more and more people are brought into the benefit and tax credit system. As UC rolls out those in the system will all ALL they are entitled to and more and more will become aware that they may be entitled to benefit or tax credits. Then the fact the non take-up figures are what the DWP and HMRC admit to – so where do these estimates come from becomes the question. If these two KNOW the non take up rate and also know that UC becomes not a penny more not a penny less than 100% entitlement then that non take-up amount will filter into the system over time meaning that UC has to cost the public purse and ‘welfare spend’ more. It may take a little while but certainly will be demonstrated in the life of a parliament and then there is no turning back and non take-up figures become a thing of the past.